Dating from the 18th Century, Le Bournaguet is a beautifully renovated and remodelled farmhouse, built in the attractive local stone which glows golden in the sunshine. With its hilltop setting, Le Bournaguet provides panoramic views of the Périgord Noir countryside and offers total peace in a very private world. We recently returned from France, having had a WONDERFUL time at "Le Bournaguet". A lovely, welcoming family house in a beautiful setting which suited us very well indeed. With its delightful and helpful staff, it more than exceeded our very high expectations. Le Bournaguet is an 18th century U-shaped, south-facing, farmhouse, built on 2 levels and comprising 3 separate buildings, which have been cleverly joined together and converted to the highest standards of comfort and efficiency. As a deliberate feature, the bedrooms are well separated from the living rooms to allow a considerable degree of peace and privacy for guests staying in the house. Entrance Hall – sliding glass front doors provide the main entrance to the house and similar doors at the other end of the hall lead to the south-facing courtyard at the centre of the “U”. Kitchen/Dining/Living area – opening to the right of the hall is an extensive open plan living area comprising a ‘no-expense-spared’ kitchen, dining table seating 14 and comfortable sitting area. The kitchen includes 2 ovens, 4 electric hobs and 2 gas rings, a grill and deep-fryer, microwave, 2 fridge/freezers, a third freezer, 2 dishwashers, a blender, toaster, 3 coffee makers and a double sink with a waste disposal unit etc. The sitting area has a large wood-burning fireplace and 2 comfortable armchairs. Main Sitting Room – through the kitchen/dining/living area, this large-high ceilinged room features a picture window at its far end and glass doors opening onto the terraces on either side. The sitting room also comprises comfortable sofas and armchairs, a massive wood-burning fireplace, satellite flat-screen TV with international channels, a radio, Apple TV, CD and Blue Ray DVD players. All bedrooms have air conditioning, flat screen TV's, Apple TV and VCR. Bedroom 1 - with a high, beamed ceiling, a 6ft-wide bed which can be split into 2 singles, and windows facing east and west. Bathroom 1 - with a bath and an overhead shower, twin washbasins, a bidet and a W.C. Bedroom 2 - with a beamed ceiling and twin beds. Separate W.C. - comprising a W.C, bidet and washbasin. Bedroom 3 - with a 6 ft-wide bed which can be split into 2 singles (although remaining within a single frame). Bathroom 2 - with a bath, overhead shower, washbasin and bidet. TV/Movie /Games Room - with a TV projector and a surround-sound system, plus children's electronic games (PSP 4) and playstation. Exercise Room - with working-out equipment. Utility Room - with 2 washing machines, a tumble dryer, an ironing board and an iron. An outside staircase descends to the gravelled area at the front of the house. There are 2 beds for visiting staff in this room. Bedroom 4 – stairs ascend from the utility room to this bedroom, with two beds. Bedroom 5 - with twin beds and windows facing north. Bedroom 6 – a children’s room with 3 single beds, satellite flat-screen TV with a DVD player, Apple TV and north-facing windows. Bathroom 3 – this lies between bedrooms 3 and 4, with lockable doors opening into each of them and comprising a bath with an overhead shower, twin washbasins and a bidet. Bedroom 7 - with a 5 ft-wide bed, glass-panelled doors on 2 sides and a wood-burning fireplace. Bedroom 8 - With a 6 ft-wide bed which can be split into 2 singles, glass-panelled doors on 2 sides, a wood-burning fireplace. Bathroom 4 - this lies between bedrooms 5 and 6, with lockable doors opening into each of them and comprising a bath, a separate shower and a concealed bidet and W.C. 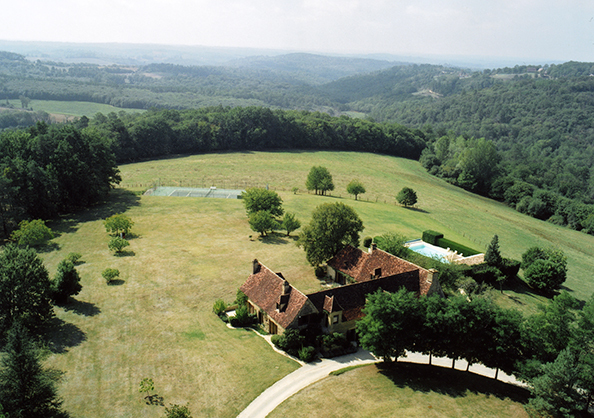 Le Bournaguet stands in 35 hectares (85 acres) of grounds on the summit of a flat-topped hill with panoramic views of the Dordogne countryside. A steepish, winding drive off a quiet country road leads past the caretakers' cottage to the front door on the north side of the house, where there is plenty of parking space. The house is surrounded by flower beds, shrubs, a wide variety of trees, and a large "potager"/ kitchen garden. Huge lawns on the south and west sides of the house sweep down to the swimming pool, the pool house and the tennis court. In the centre of the “U” is a south-facing courtyard with a dining table seating 10, shaded by a large sun umbrella. Accessed from the kitchen/dining/living Area is the west-facing terrace, with a table seating 12, shaded by trees and a large sun umbrella. Nearby is the charcoal-fired barbecue. The filtered, alarmed and heated swimming pool with underwater lights measures 13.5 x 6 metres, with a maximum depth of 2.1 metres, and Roman steps at its shallow end. There’s an extensive range of pool furniture, including a table seating 8 and 2 large sun umbrellas. The pool is very private and partly protected by a high hedge. Pool heating, if required, will be charged @ £120 per week, and will be deducted from the Booking and Security Deposit (see Rents & Terms). The comfortable and convenient pool house includes 2 day-beds, a 3-ring electric cooker, a sink and a fridge/freezer at one end and a changing area with a shower, wash basin and a W.C. at the other. The splendid all-weather tennis court has a practice wall at one end and panoramic views over the surrounding countryside. A tennis coach is available by prior arrangement. Le Bournaguet enjoys a prized, panoramic setting overlooking the magical countryside of the Périgord Noir in south east Dordogne. This stunning property is 5 kms (3 miles) from the fascinating small town of Sarlat-le-Canéda (known simply as ‘Sarlat’) which has excellent shopping facilities of all kinds (including 4 supermarkets), plus a wealth of restaurants from Michelin-starred to more modest establishments which nonetheless pride themselves on their ‘cuisine’ – good food is taken very seriously in the Dordogne! Apart from hosting a renowned international film festival every November, Sarlat boasts one of the best day-time Saturday markets in the region – held in the heart of the beautiful medieval town centre. This centre, floodlit at night, has all the atmosphere of a glamorous stage set and is well worth a nocturnal visit. The international airports of Bergerac (Roumanière), Brive-Souillac, Brive-la-Gaillarde and Périgueux are within an hour’s drive, whilst Bordeaux’s rather larger international airport (called Mérignac) is 2¼ hours away. The nearest train startion is at Souillac (35 kms), whilst the super-fast train, the TGV, stops at Brive-le-Gaillarde (50 kms). Pets are allowed at the owner's discretion. There are 2 telephones and Broadband/WiFi internet access throughout the house. There's a computer screen/keyboard and a printer/scanner. There is a movie/cinema room with a large selection of films. There are 2 cots (both with bedding), and a high chair. This is very much an “all-year-round” house, and is therefore centrally heated throughout. Wood fires can be lit in the sitting area at one end of the kitchen/dining area, in the sitting room, and in bedrooms 7 and 8. Wood will be provided if and when required. The cleaner/s is/are paid by the owners to carry out housework on 6 days per week for 6 hours per day. This includes washing up, and cleaning the kitchen, living rooms, bedrooms, bathrooms and terraces, as well as making breakfast if and when requested. Any additional hours of work (including washing and ironing tenants’ laundry and babysitting), and paid direct to those concerned at the rate of €10 per hour. A cook can also be arranged (in advance) for as many dinners and/or lunches as may be required. A tennis coach, a masseur and/or tailor-made tours of the surrounding region can also be arranged in advance. There's a small pond in a wood outside the gated area of the property. Whilst shallow, parents with small children should be aware of its existence. Le Bournaguet has table tennis (with bats and balls) which can be set up in the garden or inside the house. There’s also a badminton net which can be set up in the garden, with racquets provided. There is a croquet set which can be set up on the large lawns to the front of the house. There is also a Boules Court in the garden. There are a number of board games (backgammon, chess etc) in the house, plus a bridge table and playing cards. Truffles and foie gras are a speciality in the many good-to-outstanding restaurants in the region, including the market and restaurants in the nearby medieval town of Sarlat. There are open-air markets in numerous local towns and villages, taking place on different days of the week and details are included in the House Manual. Very well worth a visit is the Saturday market in Sarlat. Fairs, festivals and concerts are held in the region throughout the summer, including the renowned Festival du Film de Sarlat every November. Details are included in the House Manual and are also available in the Tourist Office in Sarlat. The nearest golf course (9 holes) is Golf de Rochebois at Vitrac (8 kms). Golf de la Forge (also 9 holes) is at Siorac-en-Périgord (10 kms), whilst the 18 hole Golf la Croix de Mortemart is near Le Bugue (15 kms). Canoes and kayaks can be hired at various points on the magnificent Dordogne river to paddle serenely past chateaux and negotiate some gentle rapids. There are numerous local riding stables where everything from lessons to pony-trekking can be arranged. Nearby are many stunning chateaux that are well worth a visit – Beynac, Castelnaud, Commarque, Les Milandes, Fénelon, Biron, Puymartin and Bourdeilles to name but some. There are also some exceptional gardens that are open to the public – Jardin/Manoir d’Eyrignac, Chateau d’ Hautefort and Marqueyssac spring immediately to mind. Amongst the many ecclesiastical buildings of note are the Abbeys of St Amand de Coly and de Cadouin. Fascinating small towns and villages abound – Rocamadour, Domme, Salignac, La Roque-Gageac, Montignac (where the caves of Lascaux are situated), St Cybranet, La Roque St Christophe, Léon-sur-Vézère etc. Hot-air ballooning is a special attraction, with many ballooning organisations to choose from. The pre-historic caves of Lascaux and Les Eyzies and their fascinating wall paintings are world-renowned. Also well worth a visit are the Grotte du Grand Roc, and the Gouffre de Padirac near Le Bugue (also with an excellent aquarium). N.B. 2 The July/August rent per week for returning tenants and/or for a 2-week booking in July/August will be reduced to Euros 8,000 per week. Unless otherwise agreed and/or as stated above, all rentals will begin and end on a Saturday, and will be for a minimum of one week. Tenants are required to arrive between 4 pm and 6 pm on the commencement day (not earlier), and to leave no later than 10 am on the agreed day of departure. A Booking and Security Deposit of £500 will also be payable to Anglo French Properties Ltd on signing this Rental Agreement. This will secure the booking, and will cover the cost of (a) calls made during the tenancy on the house telephone, (b) replacing/making good any losses, breakages and/or damages incurred during the rental, (c) Pool heating if required @ £120 per week, and (d) any exceptional cleaning work which may be required at the end of the tenancy. This Deposit will be refunded (less any deductions as outlined above) within 4 weeks of the tenancy’s conclusion. Unless otherwise agreed, there should not be more than 15 people, including children and babies, staying in the house at any one time. The owner’s insurance policy requires that all exterior doors are locked, that all windows and shutters are securely closed, and that all fires in the fireplaces have been extinguished prior to tenants leaving the property at any time.